The Charme Hotel Villa | Principe di Fitalia is set in tranquil countryside just 8 km from Syracuse. In addition to the fascinating architecture and the rich historical legacy of the UNESCO World Heritage Site, the hotel is located just 800 m from the Natural Marine Reserve of Plemmirio, and 4 km from the ancient island of Ortigia. We recommend guests fly into Catania Airport (60 km distant). The Charme Hotel Villa | Principe di Fitalia is the end result of the careful restoration of a late 19th century aristocratic residence. A touch of Mediterranean creativity has been added to the refinement and style of the villa, only serving to enhance its uniqueness, set in a nice park. The hotel has been expanded with three new modern buildings, which have been assigned with 5 stars: the Wellness & Spa Hotel | Principe di Fitalia. In the central building are all services, the reception, the restaurant Ippocampo, the big Spa with 2500 sq.m. surface, an area for children, the gym, the internal pool, the children play area with a baby sitting service from 16:30 to 19:30 complimentary included. The hotel has in total 53 rooms, a big swimming pool of 800 sq.m., a baby pool of 300 sq.m., a sun terrace equipped with loungers and umbrellas, a heated internal pool of 200 s.qm. surface. All the rooms at the Charme Hotel Villa | Principe di Fitalia are a combination of tradition furniture and modernity. They have satellite TV, a minibar, safe, Wi-Fi connection, air conditioning, bathtub or shower, hairdryer and complimentary toiletries. In the historic Villa are 21 rooms, furnished in the traditional Sicilian or in a modern shabby chic style, embedded in the Mediterranean garden. Standard – 16 sq.m., double room, bath with shower, view of the pathway, ground floor or 1st floor with little patio. 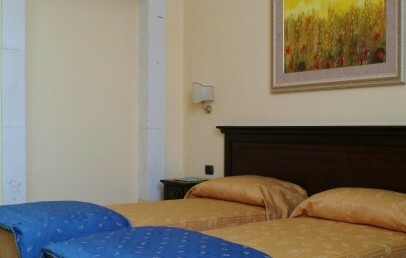 Superior – 20 sq.m., double room, bath with shower, garden or pathway view, small patio or balcony with chairs and table. Double for single use – 16 sq.m., double room, bath with shower, view of the pathway, ground floor or 1st floor. Triple – 21 sq.m., bath with shower, garden or pathway view, ground floor with patio (chairs and table). Quadruple – 23 sq.m., good for family, can host up to 4 people, bath with shower, ground floor with patio (chairs and table), garden view. 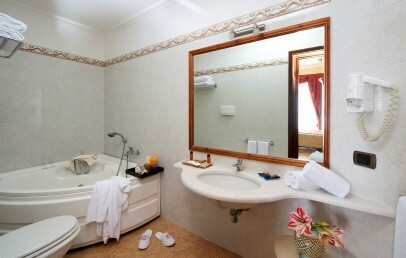 Junior Suite Classique – 40 sq.m., an open space room, bath with whirlpool tub and two balconies. The beach "Arenella" (beach service open from 01/06 to 22/09) is just 3 km from the Charme Hotel Villa | Principe di Fitalia. This private beach has a wooden sun deck for guests as well as parasols and sun loungers. Other stunning beaches are located close by and called San Lorenzo, Marzamemi and Calamosche. - wet area, Finnish sauna, bio sauna, Turkish bath, Hamman, ice cave, Wassar multi-sensory shower treatments, dry Kneipp treatments, float tank, Jacuzzi pool (25 sq.m.). - 3 booths for customised treatments – hot stone massage, Ayurveda, couples massage, mother and child massage. - Private Spa of 150 sq.m. that can as well be used for private events. - heated pool with counter-current swim system. Beauty treatments and medical beauty treatments available too. Guests can expect typical products, locally sourced food and an impressive selection of the best Sicilian wines at the Charme Hotel Villa | Principe di Fitalia’s restaurant. The following services are available: mountain bikes, internet and fax, daily newspapers, children playground (indoor and outdoor), tennis courts (extra charge), play room with ping-pong table, football table, game boards, private beach (open from 01/06 to 22/09, extra charge), sundeck with sun loungers and sun umbrellas, outdoor pool, organised excursions (extra charge), shuttle to and from Ortigia and beach. Tourist tax – The municipality of Syracuse charges a tourist tax of € 1,25 per person per overnight for the first 4 overnights, valid in November, January and February. € 2,50 per person per overnight for the first 4 overnights, valid for rest of the year. 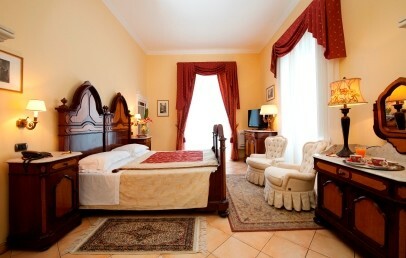 Comfortable double room that carefully combines tradition and modernity. Located on the ground floor or on the first floor. They have a satellite TV, a mini bar, a safe, Wi-Fi connection, air conditioning and en-suite bathroom with shower, hairdryer and complimentary toiletries. They overlook the pathway and have a little patio. 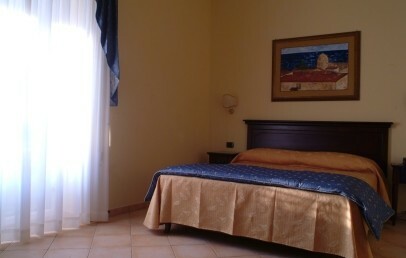 Comfortable double room tastefully combining tradition with modernity. The rooms have satellite TV, a mini bar, safe, Wi-Fi connection, air conditioning, bathroom with shower, hairdryer and complimentary toiletries. The rooms have a small patio or a balcony with chairs and table and overlook the garden or the small road. Room located on the ground floor with a bathroom with shower, hairdryer and complimentary toiletries. It has a satellite TV, mini bar, safe, Wi-Fi connection and air conditioning. The Triple room has a patio equipped with chairs and small table and a view over the garden or the pathway. 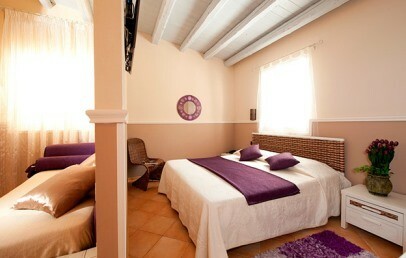 Quadruple rooms located on the ground, ideal for families as they can accommodate up to 4 people. They have two separate rooms – one on the mezzanine level or separated by a wall unit – and a bathroom with shower, hairdryer and complimentary toiletries. They are equipped with satellite TV, mini bar, safe, Wi-Fi connection and air conditioning. The Quadruple rooms have a patio furnished with a small table and chairs and view over the garden. Junior Suites, on the first floor, have a bedroom, comfortable living area and bathroom with shower and Jacuzzi, hair dryer and complimentary toiletries. They are equipped with: 2 satellite TVs, mini bar, safe, Wi-Fi and air conditioning. Junior Suites offer a balcony with pool view.